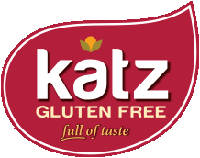 A few weeks ago I enjoyed a delicious gluten free dinner, in the company of good friends, at a venue located in Providence, Rhode Islands’ historic Federal Hill district – otherwise known as “Little Italy”. Chosen not only because it was one of the very few restaurants offering a gluten free menu on the Hill, but also due to their notable RI Monthly Magazine’s “Best of Rhode Island” awards, including Best Italian (2011), so I was anticipating an especially satisfying dining experience, and I’m happy to say Pane e Vino delivered. 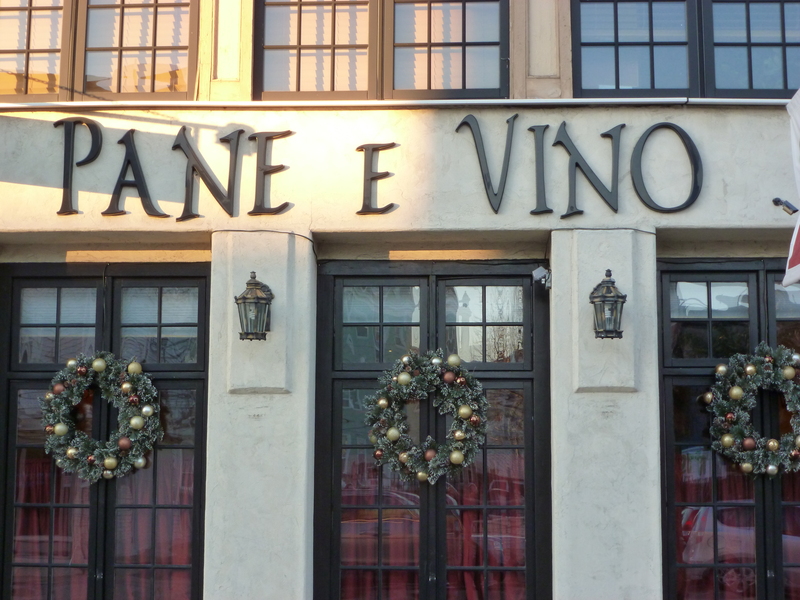 Located at 365 Atwells Avenue, in the heart of the Hill, Pane e Vino, Italian for “bread and wine” welcomes you the minute you walk through the entrance doors of the handsome historic building. From the hostess’ greeting to the warm amber interior lighting, Pane e Vino is filled with charm. Vases of beautifully arranged fresh flowers adorned every alcove, filling the air with an enticing aroma … not surprisingly, Pane e Vino was also voted Best Romantic Restaurant by Best of RI (2011). 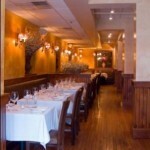 Antipasti (including Caprese, Cozze all’ Arrabbiata, & various insalata & ranging in price from $8 – $24); Farinacei (GF pasta dishes including Penne Bolognese, Penne con Cime di Rapa, Penne alla Fra’ Diavolo from $16 – $29); Secondi (poultry, veal, and seafood from $19 – $26); and a nice variety of items from the wood burning grill (including Bistecca alla Griglia, Costoletta alla Griglia, Salmone alla Griglia from $25 to $35). If you don’t know Italian, you may want to review the complete gluten-free menu below describing ingredients in English! 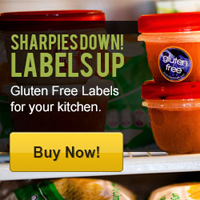 The GF menu noted many of the items on the regular menu could also be modified to be gluten-free and “though the kitchen is not 100% gluten-free, the chef will take precautions to avoid cross contamination by preparing the meal on cleaned surfaces”. 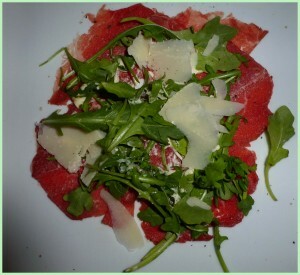 Our server was accommodating and knowledgeable about the gluten-free menu and I was immediately at ease and for an appetizer ordered the Carpaccio ($10), with a base layer of beef tenderloin, topped with baby arugula and grana padano, a delicious cheese, and drizzled with a Worcestershire aioli sauce. The salmon was fresh and cooked perfectly. 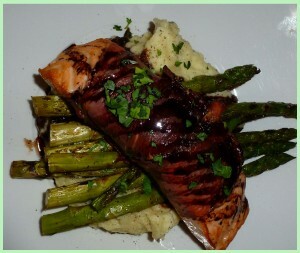 It came with a drizzle of sweet balsamic sauce, and was perched precariously over a middle layer of roasted asparagus, and a bottom layer of THE most creamy, buttery garlic mashed potatoes. The asparagus was grilled and to just the right tenderness. All the items were artfully presented by the Chef de Cuisine Fraser Davis and his kitchen staff. 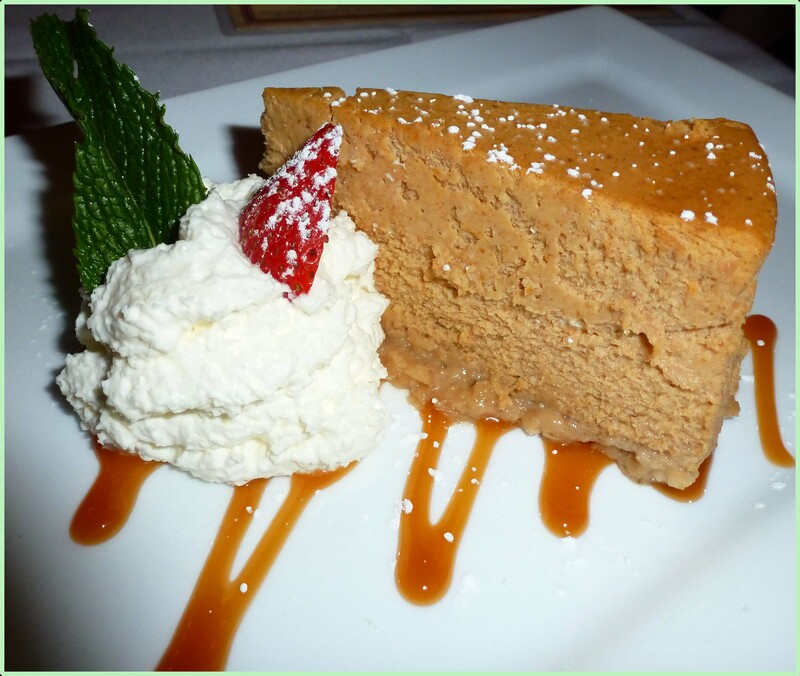 After consuming every last morsel on my plate, I thought I would, alas, have to pass on Il dolce, but then I quickly rationalized that in the interest of providing a “thorough” review, it was my duty to review a dessert as well …! cream and a sprig of mint. and a perfect sweet ending to the evening. One final remark about the interior. While I don’t often comment about a restaurant’s “facilities”, I do have to briefly mention Pane e Vinos’. 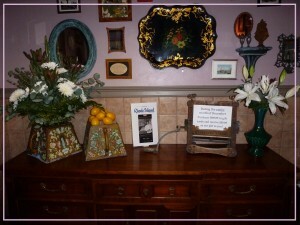 Let’s just say if RI Monthly had a category for most charming toilette, Pane e Vino would win that award too! (rev. 12.31): just found out the name of the designers of the restrooms! Mario & Richard – you’ve got to check out these guys at Recollection Design Studios: http://www.recollectiondesign.com . 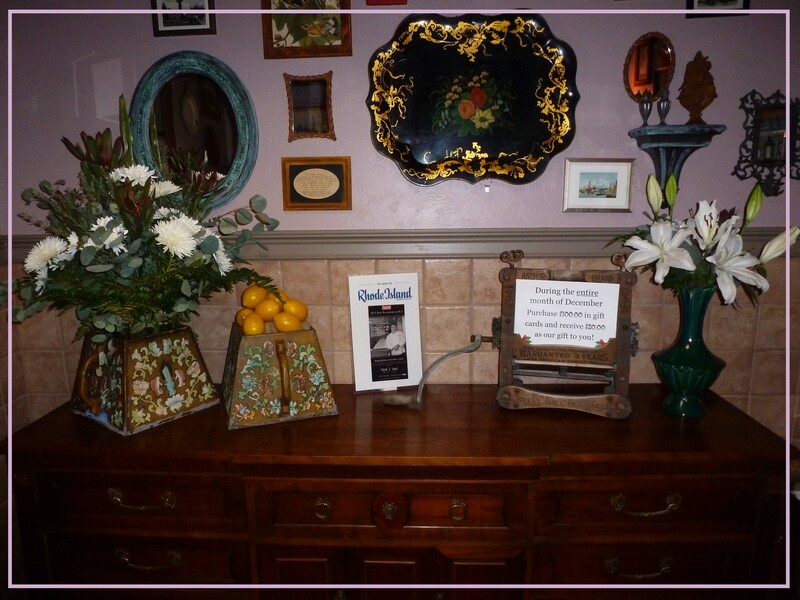 You can see the Pane e Vino “mens” room on their site … but I also recommend a visit next time at Pane e Vino! I’m told the design of the two rooms tell a story: the “mens” room is based on an Italian man’s immigration to US, & the “womens” room is his true love’s room back home in Italy. There are love letters between the two posted. Another great reason to visit Pane e Vino, to find & read the love letters! 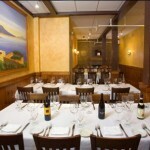 Though Pane e Vino is well suited for a romantic dinner for two, it accommodates families and larger groups as well. 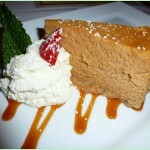 The restaurant offers a fixed price gluten-free Trattoria menu ($19.95 per person, which includes antipasti, entrée, dessert and coffee/tea) which is available Monday through Friday from 5:00 p.m. to 7:00 p.m. and all day Sunday. 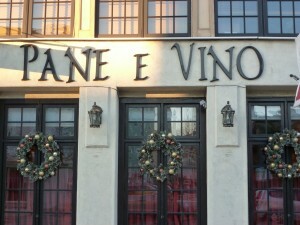 Pane e Vino is located at 365 Atwells Avenue, on historic Federal Hill in Providence, RI. Open every night at 5:00, except on Sundays they open at 4:00 pm. Reservations recommended. Valet parking available. I’m heading to Providence this weekend, will definitely check this out! Thanks.